I've been keeping up with I Wish You a Merry Quilt Along, but I haven't posted my blocks since the first one. 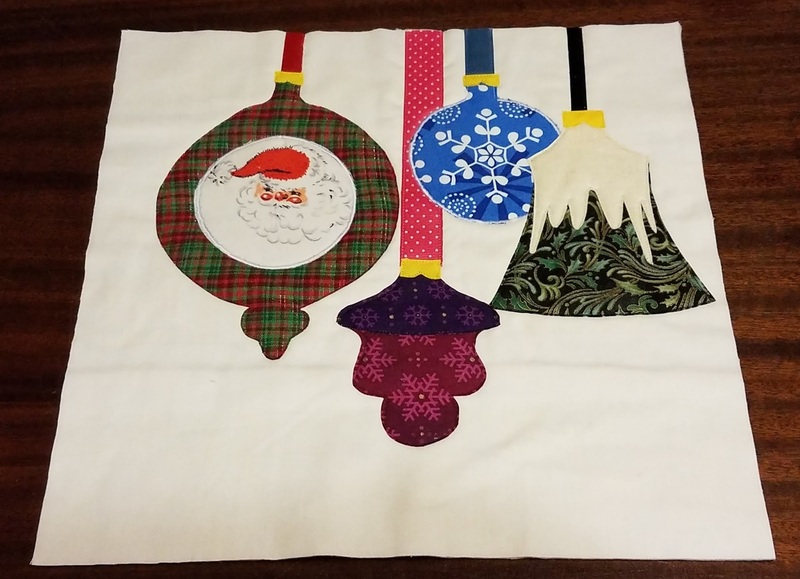 Block #3 was designed by Laura of Slice of Pi Quilts and is Santa's Belt. There is a Facebook group for the 200+ people quilting along and one of the great things about having to wait a few days to make my block is I get to see what others have done and steal their ideas. I would not have thought of creating a belt buckle on my own, but I saw several others do it and I liked it. I'm doing these with a Quilt As You Go method, so I added extra to the outside pieces when I cut so I would have room to trim down after quilting. You can tell that I trimmed this one unevenly. Maybe Santa is far enough into his route that his belt is crooked? 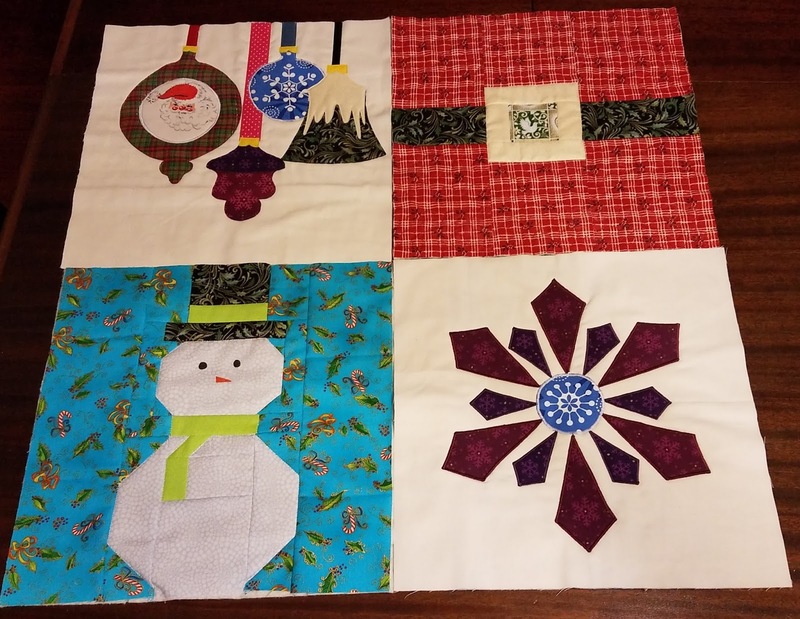 Block #4 was designed by Jennifer of The Inquiring Quilter. She used some of her antique ornaments as the inspiration for her block. I really love the fussy cut Santa but when my son (age 3) saw it the morning after I finished it, he said "Santa is grumpy!" I didn't think so, but we now all refer to Grumpy Santa around my house! I used grosgrain ribbon for hanging and hope they hold up okay. I've been using the crafted applique method for all the applique. This block was then stitched down with just a straight stitch. 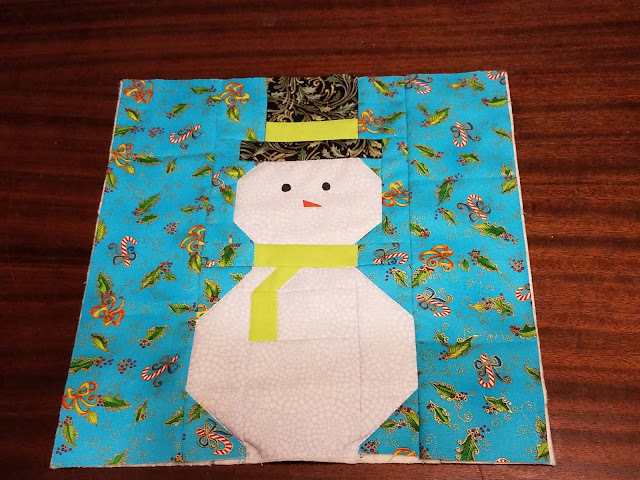 Block #5 was designed by Sherry of Powered by Quilting and is an adorable snowman. I went super simple with mine and admit that I used fabric markers for the eyes and nose. I have loved all the amazing variations of this snowman so much that I am now making an additional quilt of just snowmen! This one is quilted and ready to go into the sampler, but I have 5 more blocks made waiting for embellishments and plan on a quilt of 9, so I need to make 4 more. If you were *really* paying attention, you noticed that I skipped block 2. That one was a tree farm block designed by April of Janda Bend Quilts. 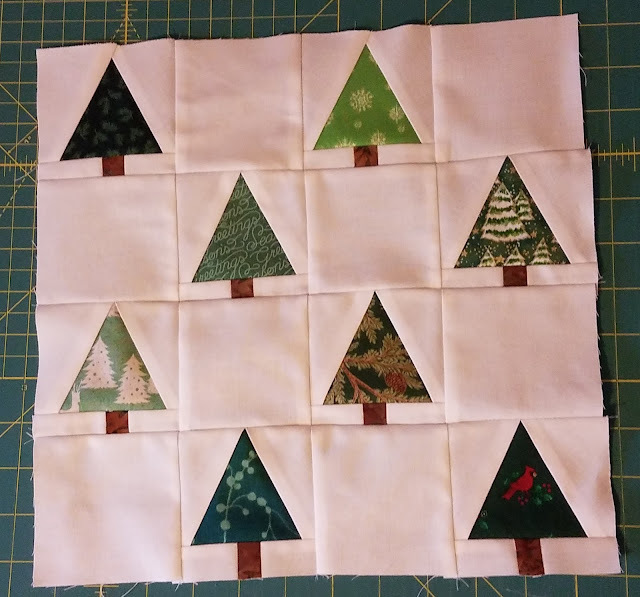 I did make a tree block, but I liked it so much that it has since been expanded and will become a quilt to hang on my front door during winter. I will make another version for the sampler but have not gotten to it yet. Here is the block when it was the size for the Quilt Along, before I expanded it. Can you tell that I have been loving this quilt along?! I am only using stash, so mine will be scrappy. I've stared embracing the scrappy and am happy that even though I have no planned color scheme and decided to stop forcing one (I gave up on all blocks having the same background when that Santa's Belt block was released) they seem to look okay together so far. Block #6 is released on September 26th and I'm looking forward to it! Very fun blocks. I like the "grumpy santa" comment. It will be something you remember every time you look at the quilt.